Hey dolls! Long time no post! This evening I have photos for you of the Aliquid Lacquer Angel In Hell collection. This collection was inspired by The Phantom of the Opera novel and musical and features six shades. Aliquid Lacquer Corpse de Ballet is described as a ballerina pink with white and black/purple flecks and green shimmer. I thought this shade was too pale of a pink when just looking at it in the bottle, but I really liked it on the nail! 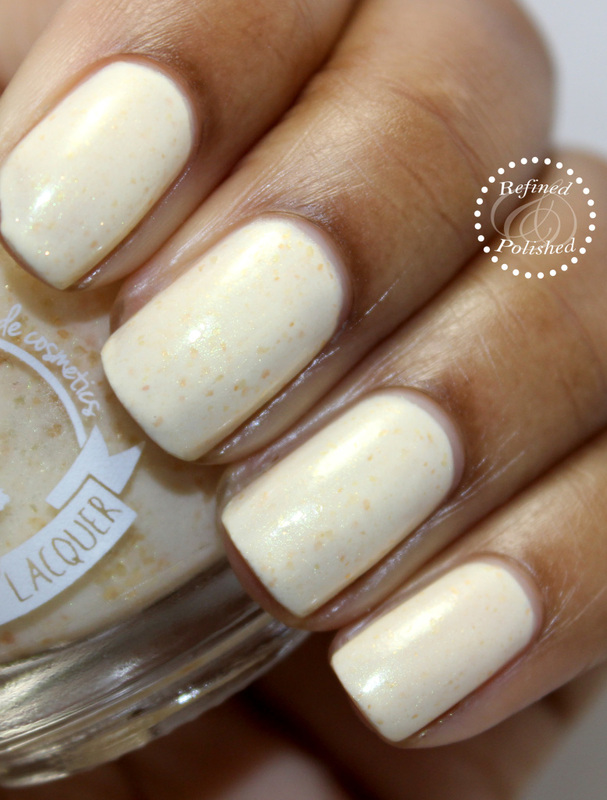 Corpse de Ballet’s formula was sheer on the first coat, but built up nicely without dragging. Three coats were used for opacity. Aliquid Lacquer Forever and a Day is dark teal-grey with green, purple, and iridescent flecks and ruddy brown shimmer. I absolutely loved wearing this polish. The formula was very pigmented and applied effortlessly in two coats. Aliquid Lacquer Maze of Mirrors is described as a full-coverage glitter with silver holographic, black, and blue iridescent glitter, plus silver flakies and silver-blue shimmer. The glitter was very dense and spread easily over the nail. One coat is shown below over Barielle Boho Chic. Aliquid Lacquer Red Death is described as a blackened rust jelly with red, silver, lime green, and yellow glitter and dark red shimmer. It’s formula was sheer, but good and the glitter spread easily. At first, I applied Red Death on its own, but it seemed like at least three coats would be needed for opacity. I then decided to apply one coat over Cirque Knickerbocker. Aliquid Lacquer The Skeleton’s Ring is described as a cream-colored polish with gold flecks and green shimmer. This is such a soft, unique shade. The formula was decent for a white; it was a little streaky on the first two coats. A third was used to even it out. Aliquid Lacquer Unending Night is described as a blackened blue-purple linear holographic polish with copper and red sparks. The formula applied effortlessly and it was opaque in two coats. This is a really pretty and diverse collection from Aliquid Lacquer. My favorites were Forever and a Day, The Skeleton’s Ring, and Corpse de Ballet. The Aliquid Lacquer Angel in Hell collection is currently available here for $10 each. R&P readers can receive a 10% discount off of a $10+ purchase using the code REFINED10. 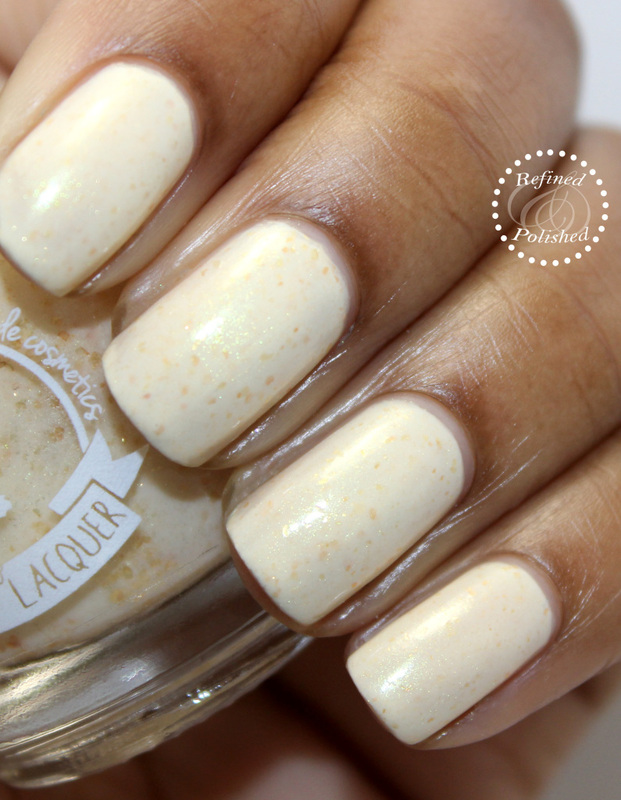 Be sure to keep up with Aliquid Lacquer on Facebook, Instagram, and Twitter for updates!